Home What is vape coil and how to use it? What is vape coil and how to use it? The heart of an atomizer is the coil and this allows for resistance to be achieved so the tank can serve as a delivery mechanism for the consumption of vapor. To further simplify, these coils are made using resistive wire and absorbent material. 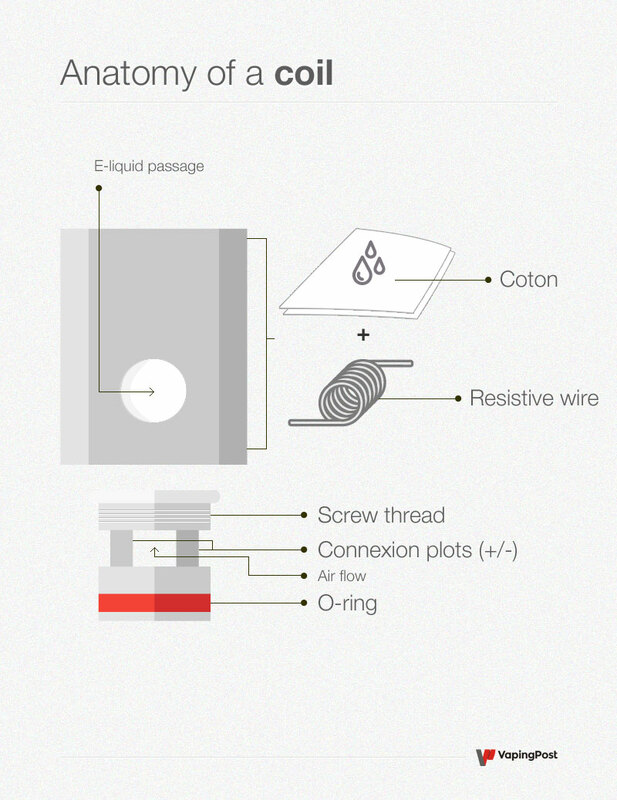 The resistance generated from the coil’s wires ultimately heats the tank’s e-liquid in order to transform it into vapor for nicotine delivery. In order to continue clarifying the appropriate information in our guides, that are specifically dedicated to explaining the operation of an electronic cigarette, it is indeed necessary to dissect one of its key components. Since the commercialization of the electronic cigarette by Hon Lik, the technical principle of vaporization has hardly changed. The quality of the coil remains the main determinant of how well the entire vapor device operates as well as the satisfaction of the overall vape experience. Coils are housed inside a cartridge or tank, which equips electronic cigarettes as well as cigalikes with Resistance Wires and absorbent wicks. Wires and wicks are what a coil is made of. A particular type of resistance wire commonly used would be Kanthal which is then surrounded by an absorbent material, like cotton, most often in fiberglass or synthetic foam. To summarize, while the materials may have evolved and the design innovation has become more creative, the principle still remains the same. Today, there are different types of metal being used for building the coil’s wires, thus determining the final resistance. In addition to the traditional Kanthal, we will now find on the market, coil wiring made of nickel-chrome, stainless steel or also titanium. In fact, some new sub-ohm tanks tend to generate more profit by embracing the versatility of innovative coil technology to the fullest extent — offering coil replacement options, designing a variety of coil choices by including every type of metal wiring available on the market. A versatile variety of coil options increases the number of uniquely flavorful experiences during the vaping process. This technology provides the Mod an opportunity to manage a plethora of settings. For instance, a temperature control option allows for better conductivity between the battery and the coil. The values of resistance used to measure these coils (metal wires) tend to decrease more and more is the industry matures. It is very common these days to use coils below 1.0 ohm, a value that has dropped by half since 2009, and which has led to creating the name “sub-ohm” (which is below 1.0 ohm). All in all, this trend is not actually a trend at all, as it now has proven to largely evolve into an industry standard — as many of the top quality tanks on the market today are exemplary models of innovative technological advancement the production of increasingly efficient atomizers. Indeed, the lower the resistance, the faster and stronger a coil may heat. With sub ohm coils they are able to withstand temperatures climbing into the triple digits. When operating vape devices that can power up sub ohm coils quickly, it is advisable to keep a healthy proportion of eLiquid nearby since The lower the resistance of the coil not only allows for a faster heating process, but also stronger heating power — which wil undoubtedly require consuming more and more of your eliquid product. In retrospect, another notable occurrence is how the diffusion of nicotine in vapor is also increased as a direct consequence of atomizers being equipped with low resistance. The e-liquid market also adapted with the popularity of relatively low nicotine levels (0, 3 or 6 mg/ml). On the side of absorbent material whose role is to retain the e-liquid and preserve the flavor, the materials have also undergone changes. Exit the synthetic foam of the first cartomizers, most coils of today use vegetable fiber (cotton type) whose very high capillarity makes it possible to feed the atomizer in e-liquid in a more important way. The emergence of ceramic systems to replace cotton is also experiencing some growth. Since it is in direct contact with the e-liquid and is subject to very large temperature variations, the resistance of an electronic cigarette will have a limited lifetime. It is important to use resistors that are adapted to your equipment (your box Mod for example). Apart from the obvious need for compatibility (atomizer manufacturers generally produce resistors only compatible with their own equipment), it is essential to adjust the power of your electronic cigarette to the optimal operating value of the resistor model you are using (refer to the instruction manual for your equipment). The table below shows how the power allows vaping to be a result of the resistance and the voltage being generated by the mod. Electronic mods have the advantage of regulating the power themselves and performing these calculations for you. Important : The higher your resistance heats up (high voltage), the more the e-liquid can degrade. If the vapor of an electronic cigarette offers the smoker a reduction of the risks faced by smoked tobacco, it is important to keep in mind that the vapor can nevertheless contain potentially harmful compounds for health (in particular aldehydes), and this all the more so when the e-liquid heats a lot and when the resistance is badly fed in e-liquid. We thus advise you not to overheat your resistance, to space the puffs, and to always make sure that your resistance is always well-saturated with e-liquid. When to change your resistance? Remaining attentive to the performance of the device is crucial for monitoring resistance. In addition concentration may be required if you want to be able to enjoy the experience and have the ability to determine when the coil has reached its life expectancy. Typically, as soon as the vaping experience Begins to taste stale, burnt or simply aged, then it’s time to replace the coil or coil wires — depending on what type of tank or cartridge is being used. If your usual e-liquid loses its flavor, if the general flavor starts to taste burnt or if the vapor seems drier than usual, it is surely time to change your coils. Visual inspection of the coils is also a good method to ensure that the resistance is not too dirty. Indeed, by a phenomenon called the Maillard effect, the e-liquid heating will undergo a degradation and produce dark residues on the surface of the resistance. Unfortunately, depending on the type of coils used, this visual inspection is sometimes impossible to perform since the resistive wire and cotton are not visible to the naked eye. You will then have to rely on your taste buds to detect tired resistance. In case of daily use, changing its resistance every fortnight, or even less, seems to us to be a fairly consistent average. Below is a list of frequently asked questions about the resistance of electronic cigarette coils. If you can’t find the answer to your question, feel free to leave your question in the comment box below. What to know when choosing coil? Each clearomizer brand has its own resistance type. If some models of clearomiseur allow the same resistor model to be used (such as some clearo Kanger, Joyetech or Aspire), it is often necessary to refer to the material data sheet and obtain only a compatible resistor. Also pay attention to the values of these resistors, expressed in ohm, and the type of resistive wire used (kanthal, nickel, etc.) in order to correctly set your mod or battery. If your resistance is low (below 1 omh) do not increase too much the power of your mod. When to change your coil? Generally speaking, you should change its resistance as soon as the usual taste of your e-liquid fades or degrades (slight taste of dust or burnt). This can be about every two weeks for daily use, or even less if your e-liquid easily clogs the resistances (generally very sweet e-liquids). You can also carry out a visual inspection to check if the resistance does not contain a black deposit, if this is the case a change is necessary. How to clean your coil? Do not proceed to a brown dry, i.e. an activation of the e-cigarette without e-liquid and air flow to make it heat to red, because this risk to alter the resistance. Prefer hot water without solvent and soak for several hours and a long drying time behind. The ideal remains simply to change the resistance. A coil always contains an absorbent material that will retain the e-liquid. When changing a resistor it must be ensured that the resistor has time to soak properly. Pour the e-liquid into your clearomiseur equipped with the new resistor and wait 5 minutes. You can also force the e-liquid circulation by aspirating through the mouthpiece (drip tip) without activating the electronic cigarette. Finally test the resistance on a low power if the parameter setting of your mod or battery allows it before vaper fully. How do I know if a coil is working properly? If your hardware aka your Mod, has a Digital screen to display the setting options, locate the resistance value, which will be measured in “ohms.” This value must correspond to the information of the recommended resistance provided by the instruction manual that is, for the most part, always included inside the packaging. This value is usually engraved on the body of the replaceable coil itself. Vapers must always be attentive, remember to look, listen and observe. Considering this, it is wise to listen for a properly functioning coil. This will be accompanied by a distinct sound or collection of sounds, but as long as you hear a crackling, then you know it is functioning properly — coils usually crackle. This is a sign that the e-liquid is being properly heated for a preferable vaporizing experience. *Fiber Freaks, a French company, announced its closure at the end of 2016.